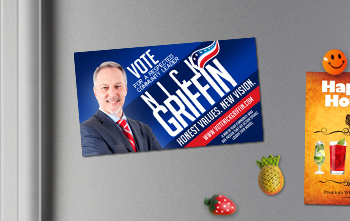 Refrigerator magnets can be a great promotional freebie for your business. The fridge is a blank canvas and a great place to promote your business. Being the daily go-to place for hungry people means your business information will be highly visible to your customers everyday. Your customized refrigerator magnets can put your business information literally at their fingertips. Print refrigerator magnets with us at NextDayFlyers. They are available in a variety of shapes and sizes for all your promotional needs. Create a great design and make your message memorable with our full color printing. All of our magnets are protected with UV coating and laminated for durability to make sure your business information is a permanent kitchen fridge fixture. A refrigerator magnet is first and foremost a decoration. You have to make sure that your magnet design is aesthetically pleasing while being relevant to your target market. Sports businesses, for instance, could use a sports-friendly design with balls which makes it more likely to be used as decoration. You have to make sure that your magnet can hold its place as well as notes that your customers may clip with it for a long time. Choose between our magnetic strengths: 17 mil., 20 mil., and 25 mil. Make your refrigerator functional by including your contact information instead of just your logo and a design. This makes contacting you easier for the customer. Refrigerator Magnets is rated 4.7 out of 5 by 10. Rated 5 out of 5 by Kimberlee from Better than expected We bought these magnets as a test pilot and they turned out much better than expected. ordering more today! Rated 5 out of 5 by FBCFW from Magnets were perfect! We purchased magnets as a prayer reminder and they looked great, and the price was well below other sites! We will definitely use Next Day Flyers for future needs! Rated 5 out of 5 by Jsur from Exactly as exepcted I ordered magnets through NextDayFlyers and couldn't be happier with the results. The colors matched perfectly and the layout was exactly as I'd designed it. I'm super satisfied with my experience.